Go from thin to thick slices without changing the blade! The external control lever lets you adjust slicing thickness on the fly. Pro-style dicing made easy. Make ¼" x ¼" dices of fruits and veggies for homemade salads, salsas, and more. Plus, the dicing parts are color-coded for easy assembly and operation. Lots of pieces – no problem! The storage case keeps all the accessories organized, with a lid to keep clean during storage. Processed foods flow easily out of the chute into any kitchen work bowl. 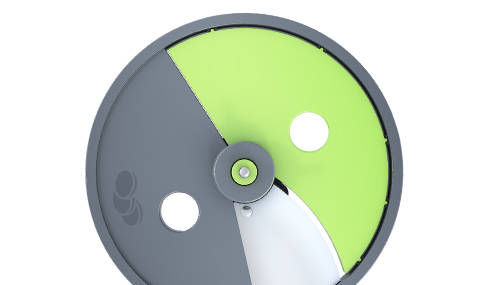 The thick dial is easy to turn with one hand, allowing you to control the power while you guide food into the chute. Master the art of the julienne. One side of the disc makes 3mm strips, and the other cuts to 6mm. Save your forearms! 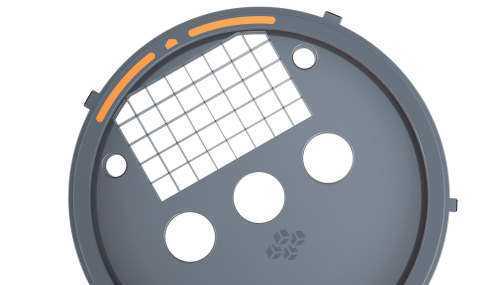 The reversible disc shreds and grates cheese, fruit, and more. 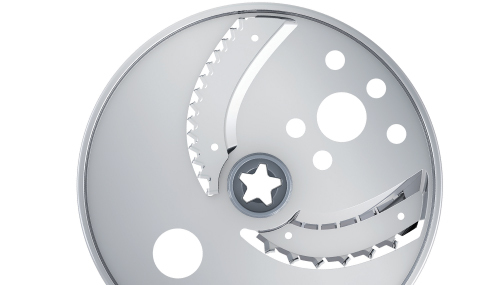 The fast-action slicing disc creates thin, elegant slices between 1-5mm. Pro-style dicing made easy. Make ¼” x ¼” dices of fruits and veggies for homemade salads, salsas, and more. Plus, the dicing parts are color-coded for easy assembly and operation. MultiPrep™ Slice ‘N Dice™ is rated 4.7 out of 5 by 19. Rated 5 out of 5 by trrg from Love this product! I absolutely love the Black and Decker Slice N Dice. This thing is amazing!I have used it for several things since I got it. I have diced tomatoes for salsa, sliced vegetables for many different applications. Not one time has the motor bogged down or slowed. It is powerful and the blades cut everything like butter! !I used it immediately after receiving it. It's easy to assemble for all the different blades. The booklet that came with it has very clear instructions on how to assemble. I am somewhat challenged when it come to assembling things, but even I had no trouble at all. I haven't used the grating blade yet, but I expect it to work as well as the other blades...perfectly.I love that it is easy to clean! All the parts went straight into the dishwasher. The blade storage case is attractive and everything has it's place. The suction feet make the product stable and I don't have to worry about it sliding around while in use.The only downside to it is that I wish it had a pulse setting. Rated 5 out of 5 by Maggie88 from So Fast and Easy - Beautiful Results This is one of the best food processor type products that I have ever used. It creates the most beautiful fruit and veggies. I know they say you eat with your eyes first and this does create a really appealing dish. If you have ever hesitated to make a salad because of time, this does the all the work so fast. You can create all kinds of shapes. slices and sizes of the vegetable or fruit. 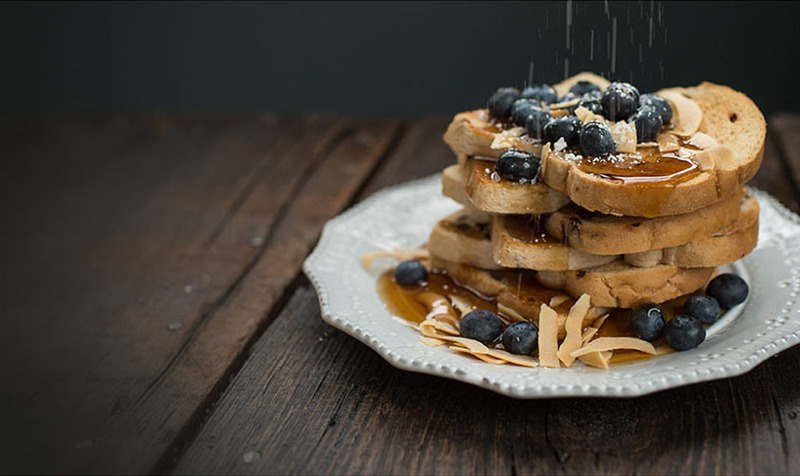 It does it so quickly that you can whip up a beautiful dish in no time. It is also super easy to clean - just put the blades in the dishwasher. It also has a nice neat storage box so you can keep everything organized and together. I find myself using it most everyday. I love it. Highly recommend. Rated 5 out of 5 by Hendrika from easy to use, all you need for preparing fresh food The Black + Decker MultiPrep Slice ‘N Dice is a nice quality all in one cutting appliance. It is very easy to assemble and what is very important it is very easy to clean. I just rinse the parts after using it and the parts can be put in the dishwasher. 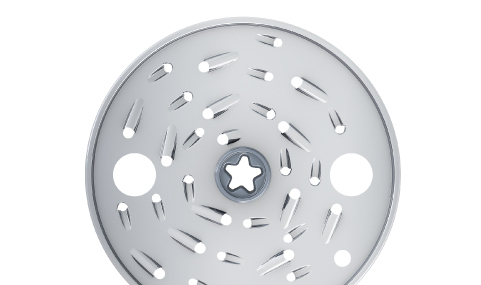 It includes and adjustable slicing disc, a reversible shredding and grating disc, a julienne disc and a dicing disc. Everything you will need for preparing fresh foods. This machine does a really great job at shredding and slicing very thinly. Great for salads, soups, chilis etc. The slicing blade can be adjusted from very thin to thick without having to take the machine apart with the external slicing control and thickness adjuster. I just love the dicing feature. I have never diced potatoes and carrots so fast and so easy.It is so easy to prepare your foods because the diced, sliced and shredded foods come directly cut out of the chute into your own bowl or pan so you can use your foods right away. The appliance stays sturdy and stable on the kitchen counter because of the suction cup feet. The controls are so easy to use and I just love how all parts and accessories are dishwasher safe. It is pretty quiet and doesn’t have that many parts to store. I love how it comes with a compact storage case so you will have all your accessories on hand. 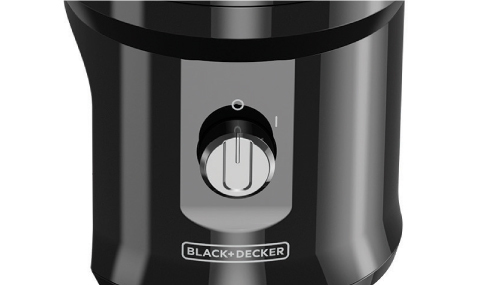 This Black and Decker machine is all that you need in your kitchen for preparing fresh sliced and diced foods. Easy and safe to use, easy to clean and compact to store. I really recommend it! Rated 5 out of 5 by terriw91 from Prep time saver! This saves me so much time prepping in the kitchen. I love buying fresh produce whenever possible, but the cutting can be so time consuming! I love the dicing blade for making salsas. I know the slicing blade will aid me in making perfect sliced potatoes for my Au gratin potato recipe. I can julienne my own carrots now! I'm so excited about this product! Rated 5 out of 5 by DianeMae from Must have kitchen appliance This little thing has so many features! It does everything so quickly! I cut all my food prep time down to a quarter of the time by using this! Very easy to use and clean. It slices, juliennes, dices, shreds, and grates vegetables, cheese and many other things! It doesn't take up a lot of space on my counter and isn't an eye sore. The suction feet at the bottom to keep it in place are a very nice perk. Rated 4 out of 5 by Princess1936 from Great kitchen tool. I have been using the slice N dice for a couple of weeks and I love this new tool. Probably my favorite thing to use it for is making a large salad. Is just so easy, the only prep is pre washing all the veggies and this thing does everything else for you. Rated 5 out of 5 by kajuncouponer from Slicing it Up What a fantastic kitchen accessory the Black and Decker MultiPrep Slice N Dice is. It seriously does it all in half the time it would normally take you to do. I love that the parts are color coordinated as well. It has multiple options to choose from, a powerful motor and stores the accessories away nicely in its own storage case. Prep time is now done in a flash! Rated 5 out of 5 by Renee45 from Great features I had the pleasure of trying Black and Decker multi prep Slice n Dice, and I am thrilled with this gadget! It slices not only thick but thin, dices, juliennes, shreds, and grated vegetables, cheese, many things! It’s not huge and bulky, and it’s easy to assemble! It’s also very easy to clean , and the attachments are easy to use! Rated 5 out of 5 by kathyjane67 from Easy Slicing! Couldn't wait to give this a try! I will tell you it did not disappoint. We made Scalloped Potatoes so we sliced 10 lbs of potatoes with this and right after we decided to make carrot cake so we shredded a couple of pounds of carrots. It's nice that it goes into the bowl. I had never had a food processor like this but found it quite handy. I love the suction cups that hold it to the counter. It has so many blade choices and the case to store them in is great so there is no chance of anyone getting cut. My daughter loves this we cut our hand cutting time down by 95%. Definitely makes cutting, chopping and shredding so much easier and faster Thank you for sending us a free Black and Decker MultiPrep Slice 'N Dice to try. I won't be able to keep her out of the kitchen. Rated 5 out of 5 by kit480 from Great Features! I received this Black + Decker MultiPrep Slice 'N Dice from Spectrum Brands to use and review. I must say, this is a quality kitchen must have. It comes with all the discs you would possibly ever need to cook like a real chef. I love to cook, but chopping and prep work takes a lot of time, well, no more! This food processor does the work for me in a fraction of the time it would take to hand chop. Easy clean up and comes in a compact storage case to keep everything in its place.. No more going through drawers to find that one piece of equipment you need. I also like the suction feet on the bottom of the storage case. Very thoughtful. I feel like I have a sous chef in the kitchen to help me! I cannot say enough good things about this MultiPrep Slice 'N Dice. I have bragged about this to all my family and friends and would highly recommend it to all home cooks. And it would make the perfect housewarming or wedding gift! Rated 5 out of 5 by bp6311 from AMAZING! 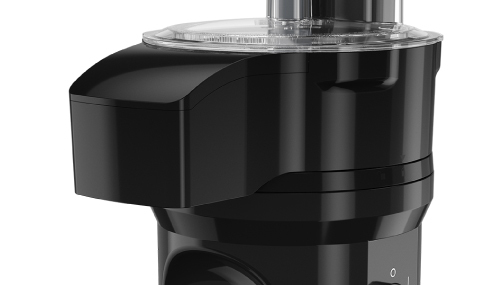 This device dices and slices like no other. Easy to use and the cut to your own specifications. The device was also easy to clean. It shaved many minutes off of my prep time which is a life saver.